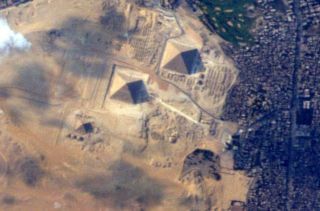 American astronaut Terry Virts of NASA took this photo of the Great Pyramids of Egypt on June 10, his last full day in space, and posted it on Twitter before returning to Earth on a Soyuz spacecraft on June 11, 2015. He had spent 200 days living on the International Space Station. Astronaut Terry Virts knows how to spend his last day in space: gazing at planet Earth from afar and posting photos of that jaw-dropping view online for all to see. Before a Soyuz space capsule returned Virts to Earth Thursday (June 11), the NASA astronaut took time out in space to photograph the Earth below, capturing spectacular vistas of the Great Pyramids of Giza in Egypt, our home planet at night and what looked to be a stunning sunrise. "It took me to until my last day in space to get a good picture of these," Virts wrote on Twitter, where he posted photos, Vine videos and mission updates as @AstroTerry. Virts and two crewmates spent nearly 200 days living and working on the International Space Station. Green auroras dance over Earth in this photo by NASA astronaut Terry Virts captured on June 10, his last full day in space before landing on a Soyuz spacecraft on June 11, 2015. In another shot, the space station soars over Earth at night, with a green ribbon of aurora dancing over the planet. "I will miss this view!" Virts wrote, and then posted four more amazing views from the station's Cupola — a seven-windowed observation deck — in a separate post. The Earth takes center stage in this photo by NASA astronaut Terry Virts, who called the image "Home" on his last day in space before landing on the steppes of Kazakhstan on June 11, 2015. Virts also posted a photo of the Soyuz TMA-15M spacecraft that ferried him back to Earth alongside crewmates Anton Shkaplerov of Russia and astronaut Samantha Cristoforetti of Italy. "My ride back to Earth today," he wrote. And after uploading a Vine video of the South China Sea at night, Virts cast his camera eye at the day-lit Earth. One photo, simply captioned "Home," shows the curve of the Earth as a new day begins on the planet. Virts' final shot was perhaps his most poignant: a view of the partially lit Earth, with the bright sun shining overhead and parts of the space station's solar arrays and robotic arm visible around the sides. The image is reminiscent of a science fiction film, but comes straight from Virts' camera. "The last picture I took this mission," Virts wrote of the view. NASA astronaut Terry Virts captured this view of the sun over Earth on his last day in space as he prepared to leave the International Space Station on June 11, 2015. It is the last photo he took before returning to Earth that day. Astronauts have routinely shared photos and videos of their lives in space using Twitter, Instagram, YouTube and other social media since 2009, when astronaut Mike Massimino became the first space traveler to join that digital final frontier. Cristoforetti's amazing space photos and videos also have provided an eye-opening glimpse of life in space over the past six months. Virts, Shkaplerov and Cristoforetti launched to the space station in late November 2014 and served first with the station's Expedition 42 crew and then stayed aboard to form the core of the Expedition 43 crew, which Virts commanded. NASA astronaut Scott Kelly and cosmonauts Mikhail Kornienko and Gennady Padalka remained on the space station, with Kelly and Kornienko in the midst of a yearlong mission in orbit.